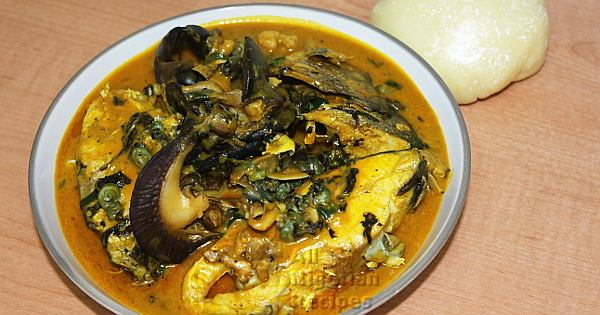 Rivers Native Soup is a gift from the people of Rivers State in the Niger Delta Area of Nigeria. These are the riverine people that use the freshest seafood to prepare expensive soups and meals. But you do not have to break a bank to prepare this soup if you are not a fisherman. You can cut down on some of the ingredients but whatever you do, make sure you add clams because it adds a lot of flavour to this soup. According to the lady who gave me the list of ingredients for this native soup, you should use only fresh seafood when preparing Rivers Native Soup. That means such ingredients like crayfish and dry fish which are dry seafood are not allowed. You can use achi or ofor as alternative to cocoyam. But achi has a distinctive taste that can ruin this recipe for some people. It ruins it for me. Habanero pepper atarodo, ose oyibo or atarugu. You can also use scotch bonnet peppers. For this recipe, I used the yellow habanero peppers. You can also add oysters to native soup. I used gilt-head sea bream fish. Fresh catfish should be your first choice of fresh fish is you can buy it where you live. Shell the clams, snails, sea snails and periwinkles and remove the intestines. In Nigerian markets, the sellers can do these for you. Watch the video below to see how I remove the shells from these seafood. For the snails, you need to remove the slime after removing the shell. Click here to see how to remove the slime from snails. Cook the cocoyam till soft. Peel and pound till smooth with a mortar and pestle. You can also blend with a power blender or food processor. Grind the uziza seeds with a spice grinder. Cut up the fish and clean. Place the snails in a pot, add the seasoning cubes, pour water to cover and cook for 20 minutes. 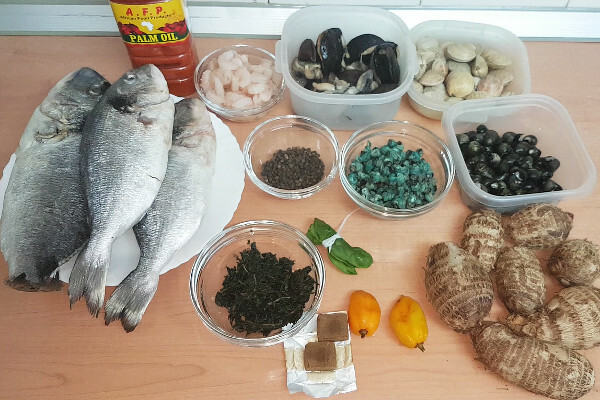 Add ground uziza, the clams, sea snails, shrimps and fish, top up the water if necessary and cook till the fish is done. Take out the fish from the pot and set aside. Add the cocoyam in small lumps. Add the bitter leaves, yellow pepper and palm oil. Cover and cook till the lumps of cocoyam dissolve. Stir the contents of the pot very often. Add the fish back into the pot of soup. Stir, cover and let it simmer. Serve with any Nigerian swallow of your choice: Semolina, Pounded Yam and many more. Watch the video video below for how Rivers Native Soup is prepared.